tibet3 -- Tibet. Day 4. Between Mt. 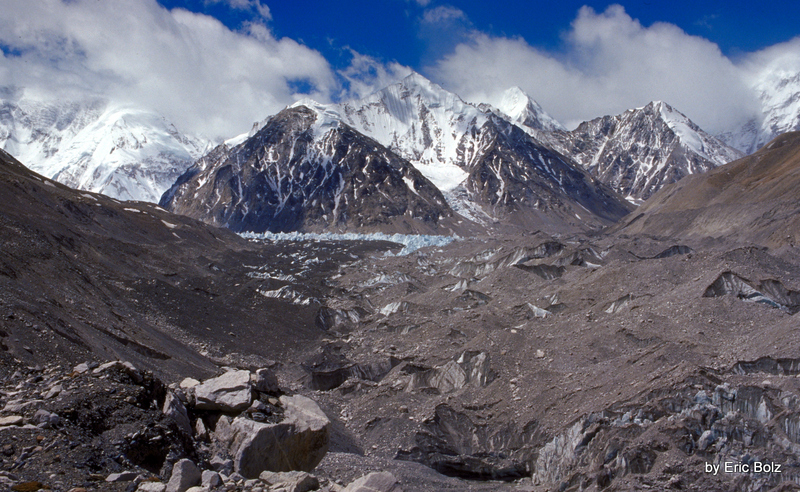 Everest Base Camp and advanced camp 2. I had planned to walk up to Advanced Base Camp III (a 4-5 day trek) but all the mountain climbers had gone home by the time I arrived. I thought it was really too dangerous to walk up the glacier alone so I opted for a day hike instead. A managed to walk past Camp I and I got quite close to the Giant Ice Saraks on the way to Camp II. But at 18,200 feet I was getting getting tired walking on the loose scree. Also, it was really quite dangerous because if I had fallen and hurt myself I would have been in real trouble. So I turned around and walked back to Base Camp.